At the beginning, the idea of “peak oil” seemed to be relatively uncomplicated: we would climb from one side and then go down the other side. But no, the story turned out to be devilishly complex. For one thing, there is no such a thing as “oil” intended as a combustible liquid — there are tens, perhaps hundreds, of varieties of the stuff: light, heavy, sour, sweet, shale, tight, dumbbell, and more. And each variety has its story, its peculiarities, its trajectory over time. Eventually, all the oil curves have to end to zero but, in the meantime, there is a lot of wiggling up and down that continues to take us by surprise. Mostly, we didn’t realize how rabidly the system would deny the physical reality of depletion, much preferring to “legislate scarcity” on the basis of pollution. Six years ago we commented on this same blog that, of all the fuels derived from oil, diesel was the one that would probably see its production decline first. 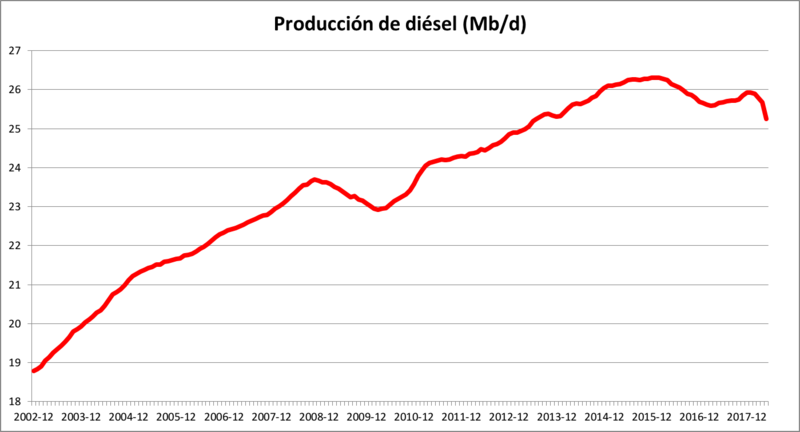 The reason why diesel production was likely to recede before that of, for example, gasoline had to do with the fall in conventional crude oil production since 2005 and the increasing weight of the so-called “unconventional oils,” bad substitutes not always suitable to produce diesel. With the data of that 2012, I wrote “The Peak of Diesel“. 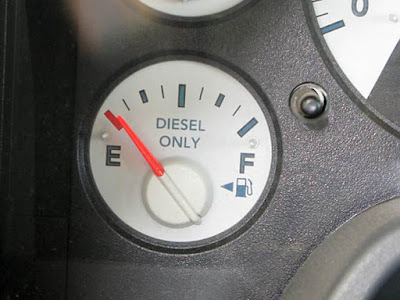 At that time, there was a certain stagnation of diesel production, but it seemed to be too soon to venture if it was final or if it could still be overcome. I reviewed the issue in 2015, in the post “The Peak of Diesel: Edition of 2015.” The new data from 2015 showed that in 2012 there had really been no peaking, although diesel production had grown less strongly if we compared it with the previous historical rate, and even the last 18 months of the period studied at that time showed a certain stagnation. Now it has been another three years, and it is a good time to look at the data and see what happened. Before starting, I would like to thank Rafael Fernández Díez for having the patience to download the JODI data, for having elaborated the graphs I show here, slightly retouched, and for having made me notice the problem that is being raised with the refining of heavy oils (We’ll see more below). He hasn’t had time to finish this post and that’s why I’m the one who wrote it, but what follows is actually his work. As in the previous two posts, we will use the database of the Joint Oil Data Initiative (JODI). 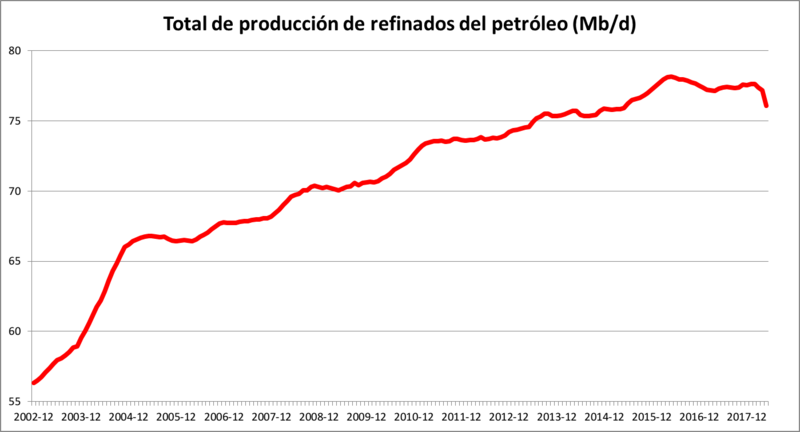 This database provides information about most of the world’s oil and refined products, but not all of them. The countries not included are countries with serious internal problems and a great lack of transparency, either because of wars or because they are very tight dictatorships. For this reason, the figures that I will show are around 10% lower than they should be if they were representing the whole world. However, given the characteristics of the excluded countries, it is most likely that their data did not change the observed trends, only the total amounts. As seen in the graph, the year 2015 marked the maximum so far. 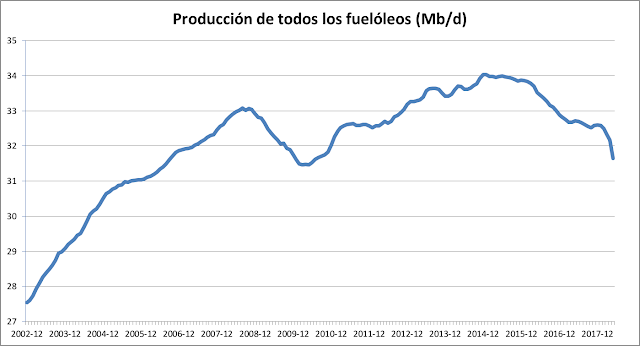 There had not been such a marked drop in production since the crisis of 2008-2009, but in the case of the fall of 2015 we find that 1) there has not been a serious global economic recession;2) the descent is lasting longer and 3) the levels of diesel production show no sign of recovery. Although it is still a little early to ensure that the peak of diesel has occurred, stagnation – even falling – is starting to drag on for too long to be ignored. This last observation is quite relevant because if, as you can guess, the industry is cracking less heavy fuel oil to ensure that the production of diesel does not go down too much, the rapid fall of heavy fuel oil will quickly drag down the diesel production. 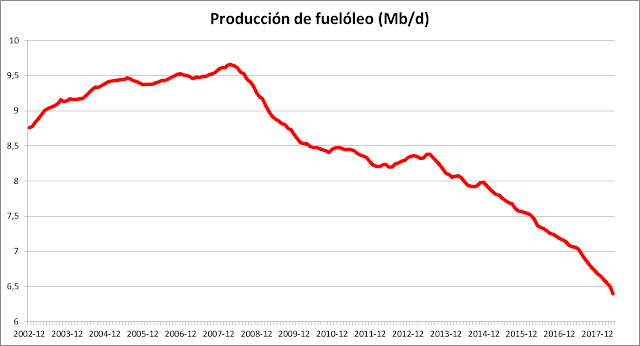 In fact, the graph shows that, after falling in 2015 and 2016, in 2017, it was possible to stabilize the production of all fuel oils, but it is also seen that in recent months there was a quite rapid fall. Surely, in this shortage, we can start noting the absence of some 2.5 Mb/d of conventional oil (more versatile for refining and therefore more suitable for the production of fuel oil), as we were told by the International Energy Agency in his last annual report. This explains the urgency to get rid of the diesel that has lately shaken the chancelleries of Europe: they hide behind real environmental problems (which have always troubled diesel, but which were always given less than a hoot) to try to make a quick adaptation to a situation of scarcity. A shortage that can be brutal, since no prevention was performed for a situation that has long been seen coming. 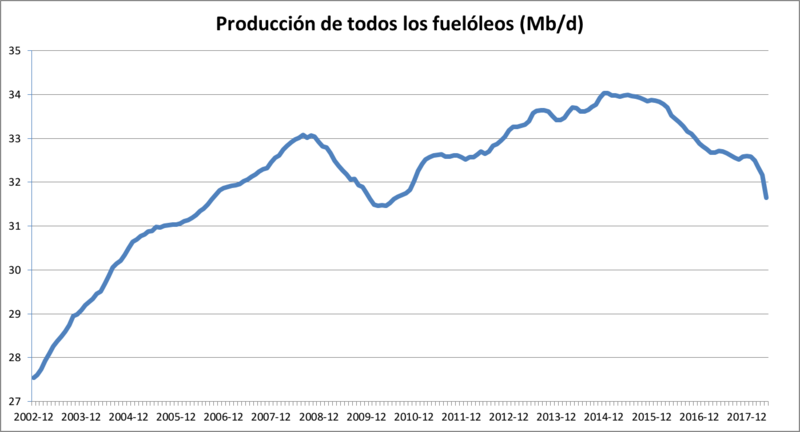 The followers of that religion called economic liberalism will insist with all their strength that what is being observed here is a peak of demand, that old argumentative fallacy that does not agree with the data (who can think that people are stopping to consume oil because they want? Maybe because they have better alternatives? Which ones?). They will argue that there is a lower demand for diesel and that this is why production stagnates and that the production of fuel oils drops because, as they are more polluting fuels, the new environmental regulations do not allow their use. It’s a bit of the old problem of who came first, the chicken or the egg. With regard to the fact that the demand for diesel does not increase, prices have a considerable influence: this is how shortages are regulated in a market economy. And, as for the environmental reasons, the production of heavy gas oil has been dropping from 2007, when there was not as much regulatory interest as there seems to be now. There is one aspect of the new regulations that I think is interesting to highlight here: from 2020 onwards, all ships will have to use fuel with a lower sulfur content. Since, typically, the large freighters use very heavy fuel oils, that requirement, they say, makes one fear that a shortage of diesel will occur. In fact, from what we have discussed in this post, what seems to be happening is that heavy fuel oils are declining very fast and ships will have no choice but to switch to diesel. That this is going to cause problems of diesel shortage is more than evident. It is an imminent problem, even more than the peaks in oil prices that, according to what the IEA announces, will appear by 2025. Note: this post was translated from Spanish using Google Translate, which did a pretty good job, necessitating only some retouches — although the result is still somewhat “Spanish-sounding” even in English! One problem is the use of the Spanish terms “gasoil” and “diésel” which may not mean the same thing as they do in English (in Italy, btw, diesel fuel is always termed “gasolio”). But these two terms indicate a very similar entity, even though maybe not identical. So, I reworked Turiel’s text a little in order to use only the term “diesel”.